LORRAINE Abel was determined her daughter with Down syndrome would never become a young woman in an aged-care facility if she could no longer care for her. Together with other equally determined Townsville parents, Mrs Abel, under the guidance of Gwenyth Cutler, fought a 20-year battle to find a permanent home for their daughters. Almost five years ago, Mrs Abel and other parishioners of St Mary MacKillop Parish, Mundingburra, successfully set up Penola Place on land donated by the Church with the support of the late Bishop Michael Putney. Their success story recently became part of the Australian Catholic Bishops Conference’s submission to the Federal Government’s inquiry into “The adequacy of existing residential care arrangements available for young people with severe physical, mental or intellectual disabilities in Australia”. The ACBC submission, giving 12 examples of Church accommodation support for people with disabilities, was one of 167 such submissions presented by a diverse range of individuals and organisations. The Community Affairs References Committee report released last month noted 6000 to 7000 young people (those under 65) are living in aged-care facilities around Australia and there was “evidence suggesting that these numbers could be higher”. Mrs Abel, now 76, said her daughter Tricia with Down syndrome, and four other women, aged from their early 30s to late 40s, were now happily settled in Penola Place. “Our main concern was to get our daughters into supported accommodation while we were still around to support them,” she said. “We are all very happy with how things have worked out. “The women have a home for life as they all support each other, living with some independence as well as having support workers. “They each have a lounge room, bedroom and ensuite. “There is a communal kitchen, lounge and dining room. “They take it in turns to cook the evening meal and each prepares their own breakfast and lunch. They do their own laundry. 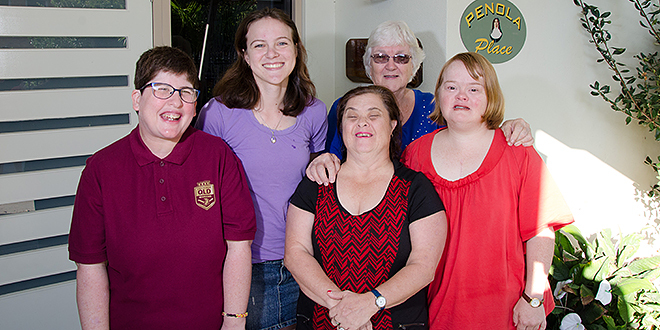 ACBC disability projects officer Patricia Mowbray, who played a major part in preparing the bishops’ submission to the Senate inquiry, said Townsville’s Penola Place would provide a model for carers in similar situations to consider. “I think it’s important that people with disability have a say in where they live, who they live with and what type of home they would like,” she said. The ACBC submission to the Government’s inquiry earlier this year outlined the Townsville families’ successful efforts to establish Penola Place. Then Minister for Disability in the Queensland Government Lindy Nelson-Carr was sympathetic to the families’ plight when they approached her. Initially the families sought funding but the minister said they would have more success of support if the women with disabilities had somewhere to live. The parish’s pastoral leader suggested a house could be built on a vacant block of land adjacent to the church and the matter was discussed with Bishop Putney, who was then Bishop of Townsville. A northern service provider Cootharinga lodged a successful submission for funding for care. Funding was also received to build what became Penola Place under then Prime Minister Kevin Rudd’s stimulus package. By September 2010, the house was up and running. Mrs Abel said the location of accommodation so close to Holy Trinity Church had many advantages. “Those (from Penola Place) attending church can make their way there without having to rely on anyone,” she said. “The women can also participate in parish activities and easily attend things like parish get-togethers. “My daughter, Tricia helps clean the church, helps with serving morning tea, assists with children’s liturgy and is always welcomed at Mass. Ms Mowbray said “disability can be acquired at any stage of life’s journey and can affect any part of the mind and body”. “A reality we all share is our vulnerability and our need for support through our life’s journey,” she said. “Our Gospel is one of Good News and solidarity, and what better place to share that Good News than from our desire to ensure people have a home to call their own and friends around them to accompany them on their journey.